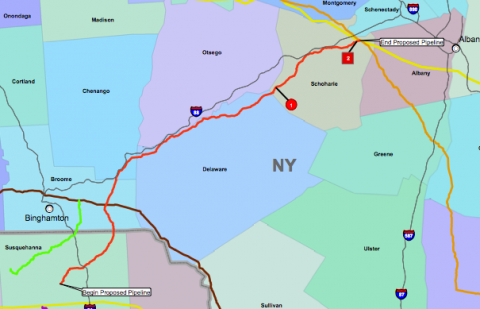 The Federal Energy Regulatory Commission issued a December 2nd order, subject to a variety of conditions being met, for construction of Constitution Pipeline Company’s proposed 124-mile natural-gas pipeline from northeastern Pennsylvania to connect with existing transmission pipelines in Schoharie County, New York. One day later, letters from a law firm on behalf of the pipeline were FedExed to those landowners who have not signed easement agreements. Daniel Estrin, an attorney with the Pace Environmental Litigation Clinic in Westchester County, wrote back on behalf of opponents Stop the Pipeline. The letters to landowners came from Philadelphia-headquartered law firm Saul Ewing. A request for comment from the law firm was referred to Constitution Pipeline Company spokesman Chris Stockton. A letter says, “Constitution would like to reach an agreement with you and strongly prefers to avoid litigation. However, if you do not accept this final offer and execute the documents enclosed with the prior written offer from Constitution’s representative by Thursday, December 11, 2014, we will proceed to initiate suit under the Natural Gas Act.” Again, Constitution’s Stockton. He says Constitution has reached easement agreements with the majority of landowners affected by the pipeline project, amounting to less than 75 percent. Estrin is calling for Saul Ewing to retract the letter and says he will enter the legal fray on behalf of Stop the Pipeline landowners if Constitution files suit. Estrin says he also has concerns about FERC. A FERC spokesman says it is not unusual for the Commission to grant a pipeline certificate subject to conditions. He adds that FERC having granted the requested authority to build the pipeline subject to conditions allows Constitution Pipeline to exercise eminent domain with those landowners who have not signed easement agreements. The proposed project to transport Marcellus Shale natural gas involves the construction of 124 miles of 30-inch-diameter pipeline from Susquehanna County in Pennsylvania into New York’s Broome, Chenango County, and Delaware Counties, terminating in Schoharie County. A group of concerned landowners plan to voice their opposition to a proposed natural gas pipeline expansion in southwestern Massachusetts. The Federal Energy Regulatory Commission is holding public meetings on the project this week.